A skier at Canaan Valley Resort is captured in mid-jump. Photo by Justin Harris. For the second consecutive year, Canaan Valley Resort ski area this week swept Liftopia’s “Best in Snow” awards in the Southeast region of the U.S., which includes resorts in West Virginia, Maryland, Virginia and North Carolina. The resort was named No. 1 in the Beginner Friendly, Most Challenging, Family Friendly, Snow Consistency and Quality, Least Crowded, and Best Value categories, according to resort general manager Steve Drumheller. The awards are based on surveys of thousands of customers, and Liftopia reports receive responses from thousands of skiers throughout the country, he said. Situated in north central West Virginia in the Allegheny Mountains, the resort is especially beloved by skiers in the Mid-Atlantic region, in part because it is a drive of 2 ½-hours from Washington, D.C. The resort kicked off its season on Friday, December 15 with some of the best opening-day ski conditions in years, according to Drumheller. 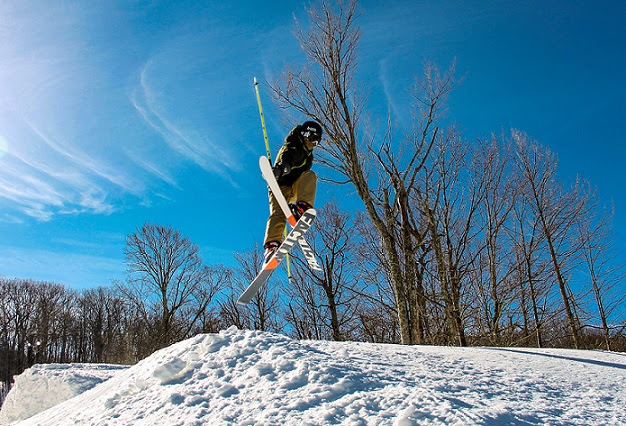 Canaan Valley Resort boasts 47 slopes and trails and a customer-pleasing mix of beginner, intermediate and advanced terrain. In addition to downhill skiing, the resort provides multiple options for cross-country skiing and snowshoeing and is home to the longest snow-tubing park in the Mid-Atlantic region, with multiple lanes running 1,200 feet, Drumheller said. Its covered outdoor ice skating rink offers sweeping views of the Canaan Valley, the highest mountain valley east of the Rockies. Liftopia operates the largest online and mobile marketplace and resort technology platform serving the ski and mountain activity industry.